Place a frying pan over medium heat, add oil/ghee or use half oil and half ghee and fry the onions in batches till they turn golden brown in colour. Transfer the fried onions to a plate lined with kitchen paper towel. Add a tablespoon of ghee and fry the cashews and raisins till the cashew nuts turn light golden brown. Transfer it to plate and keep it aside. In a food processor, grind ginger, garlic and green chillies to a coarse mixture and keep it aside. Grind the ingredients mentioned above for making the garam masala and keep it aside. In large pan ,boil water with all the whole spices, ghee and salt. When it comes to a rolling boil, add the soaked rice. Cover and let the rice cook on low heat till done. Fluff the cooked rice with a fork. Marinate the chicken with 1/4 tsp turmeric powder and pepper powder for 20 minutes. Heat a heavy bottomed pan, add the ground ginger, garlic and green chillies, stir well and cook for a few minutes till the raw smell goes away. Add the chopped tomatoes, saute for a few minutes till it turns mushy. Add in the mint leaves and mix well. Add chicken pieces, salt and ¼ cup water, cover with a lid and cook till the chicken is done. Add half of the fried onions to the chicken, combine well and cook covered for 5 minutes. Mix in the prepared garam masala and saute for a couple of minutes. Add chopped coriander leaves and lemon juice and mix it in. If the masala gets too dry, add a few tablespoons of water and cook for a minute. Make sure the chicken masala is not watery. Adjust the salt according to your taste. In a bowl, soak the saffron in ¼ cup milk and keep aside for 5 minutes. Evenly spread half of the chicken masala in the bottom of the pan. Top it with half of the cooked ghee rice. Sprinkle half of the fried onion, cashew nuts, raisins, chopped mint, coriander, few drops of rose water and saffron milk. Repeat the layering with remaining chicken masala and ghee rice. 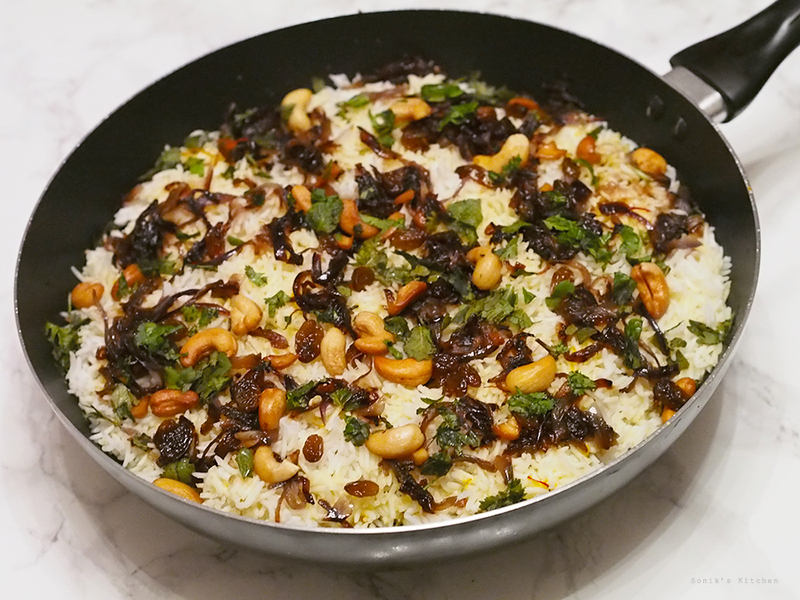 Spread the remaining fried onions, chopped mint, chopped coriander leaves, cashew nuts, raisins, rose water and saffron milk over the rice. Cover tightly with aluminium foil and place a lid over the pan. Dum cook the this over low heat for 10 minutes. You could also dum cook in an oven. 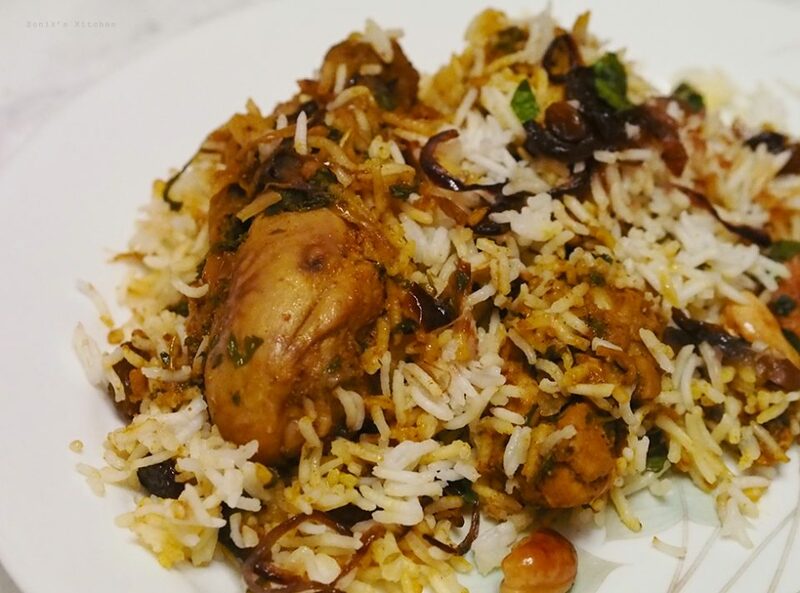 Preheat the oven to 175 C, layer the chicken masala and rice and other ingredients in an oven proof deep dish, cover with aluminium foil and place it on the lower rack and cook for 20 minutes. After 10 minutes of dum cooking, remove the pan from the heat or oven. Let cool down for a few minutes. Serve the biryani along with raita, dates or lemon pickle and pappadam.